Through the distant galaxies and beyond, our brand new galaxy quest fantasy fighter sword delivers in a big way with its uniquely designed blade. 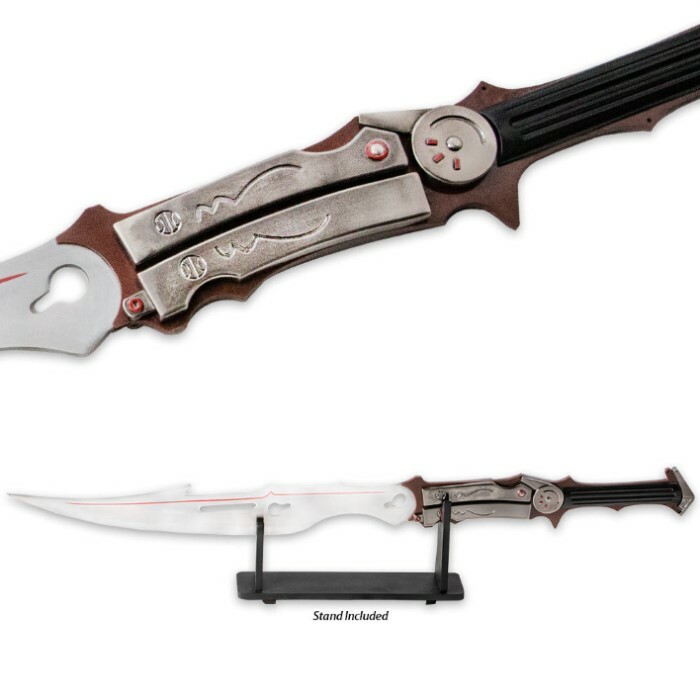 The intricately styled fantasy edges and points make this blade a showpiece to have in your True Swords collection. The 27" carbon steel blade meets a hard ABS composite handle that continues the stylish theme. Display it boldly on the included table top display stand. It measures 46" from end to end. Liked the sword but the tip was bent and the blade was scratched. Response: We would like to apologize for the condition you received your sword as this is unacceptable. Please contact customer service at 800-735-3326 so we can get you a new one shipped. Once again we do apologize for any inconvenience this may have caused. The build is solid, but it doesn't have any of the cool fold gun flip tech. Obviously. The designs are pretty close to the mark, and the construction is really good for a display piece. Maybe even a photoshoot. No playing with this one though. It can't take much of a beating. This is Lightning's gunblade from FFXIII minus the side pieces. Either way I love it and it's a great gift for a FFXIII fan! Final Fantasy stuff is licensed. All those idiots out there that keep complaining about them not naming it right.. they did it for a reason.. if they didn't then they wouldn't have been able to sell this item... duh.. 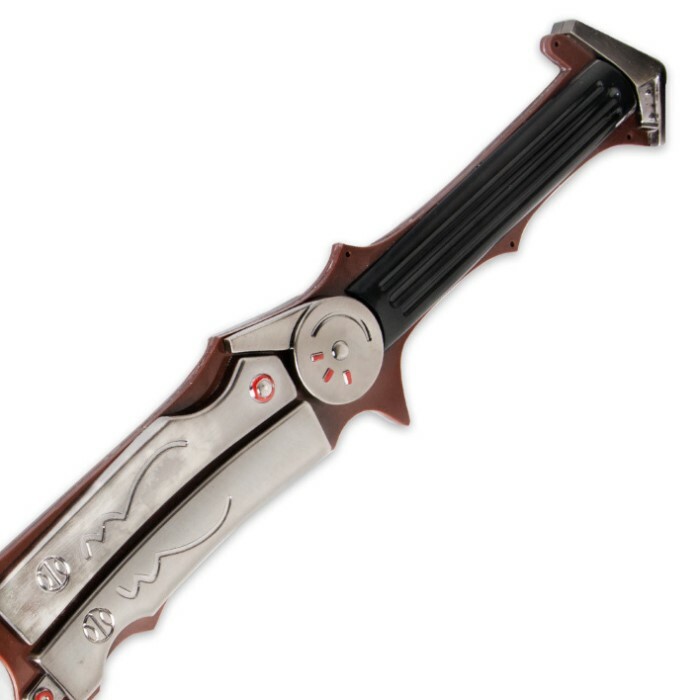 It is jus a weird version of lightnings sword in final fantasy 13. Great sword for show or as a prop, but revise the name and description. It's painfully obviously how similar this is to Lightning's weapon from the Final Fantasy series. It's hardly "original" and there is little if any elements that shout STEAMPUNK when you look at this sword. Overall still a good sword for the price. 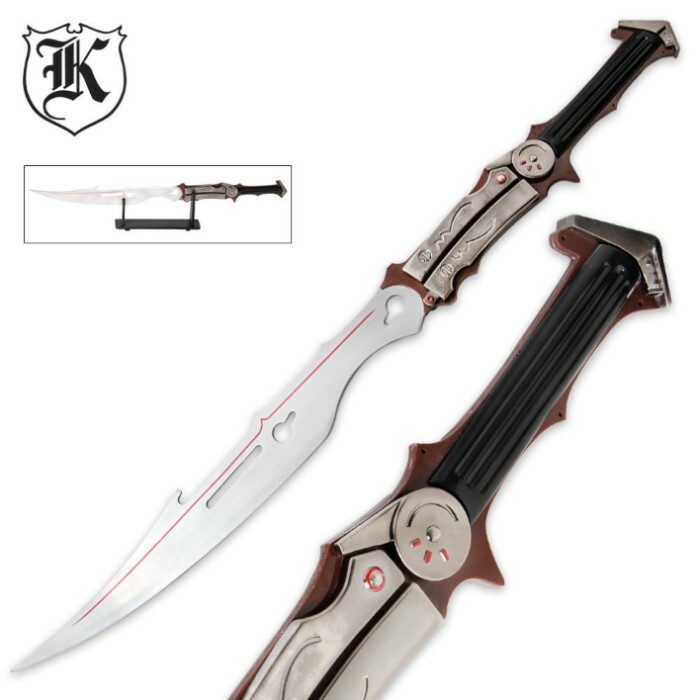 this sword, or "gun blade" as its called, is from the video game Final Fantasy 13 and was used by Claire "lightning" Farron. in the game it has the ability to shift between gun and sword which is why its called a gun blade. the final fantasy series has had many different variations of the gun blade.